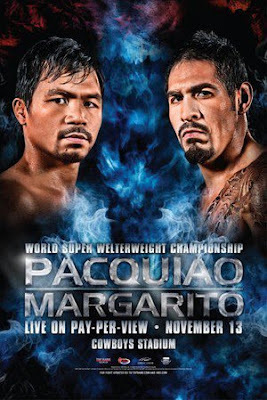 Win a ticket to the Pacquiao vs. Maragarito boxing match (World Super Welterweight Championship) on November 14, 2010 to be held at the SM Mall of Asia by joining the Alaxan FR Aray Ko Galing Ko Promo. 2. Add yourself as Fan of Alaxan FR Facebook Fan Page. 3. Take a picture of yourself wearing the new Alaxan FR Pacman T-shirt and make that photo your profile picture as soon as you get the Alaxan FR shirt. 4. 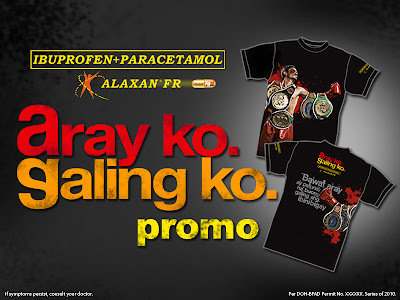 From Nov. 8 to 12, 2010, wait for the announcement of Alaxan FR Facebook Fan Page when you can post words of encouragement for Manny Pacquiao. The first 5 posts each day will win one (1) free ticket to the Manny Pacquiao vs. Antonio Margarito fight at SM Mall of Asia ONLY. Each winner will win one (1) free ticket. A person can only win ONCE during this entire Promo. Winners will be contacted via Facebook. Alaxan FR fan page will send notice via Personal Message. Winners must confirm within 24 hours after the message has been sent. If winner hasn’t replied after 24hours, Alaxan FR fan page shall choose the next winner in line. Winners can claim their tickets/prizes at 6th floor Cambridge Bldg., 108 Tordesillas cor Gallardo Sts., Salcedo Village Makati. Winners will be notified as to when they can get their prizes.